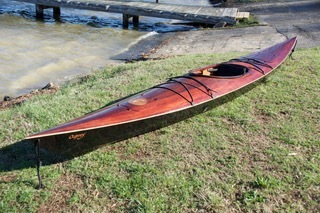 Rusty Wendt of Greensboro, North Carolina recently built Shearwater Sport kayak, which he named OSPREY. The name is a reminder of a trip he took in the summer of 2016 to the Grand Teton National Park, when he viewed ospreys soaring along the Snake River. This is Rusty’s third wooden boat, and the first in which he used dye to highlight the strip-plank decking. Chesapeake Light Craft, 1805 George Ave., Annapolis, MD 21401; 410–267–0137; www.clcboats.com.